okay, folks, don’t move from those seats because i am about to tell you all about the phenomenon that is true food kitchen. my coworkers marty and batkinson had discovered true food on one of their many trips to dallas. they finally took me with them when i joined the party, and this place is close to life-changing. the atmosphere is clean, fresh, and crisp. the staff is relaxed and honest. the food and drinks are new and exciting and delicious. one week in dallas, we went to true food three nights in a row. that’s three nights of the four nights we were there that week. whoopsies! how does it feel when you walk into true food kitchen? it feels like a cross between anthropologie and urban outfitters. it’s a modern farmhouse. it might remind you of a coffee shop in seattle because it’s so “green.” i almost wished the tv wasn’t at the end of the bar. it kind of spoiled the ambience! having eaten at true foods so many times, i’ll break our adventures down by course. our first night i just had to get a specialty drink; they just looked like so much fun! how could i resist something called the “spontaneous happiness”? i could not! 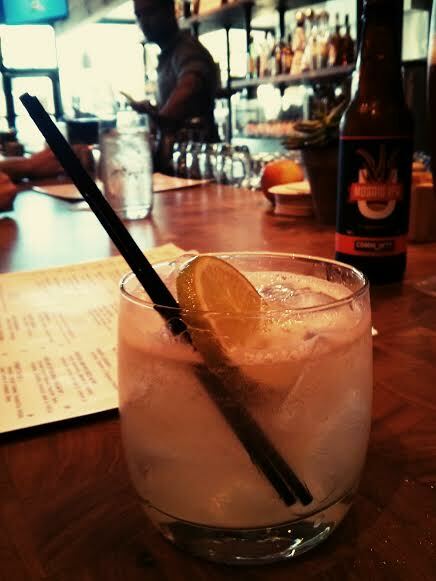 it was ginger and vanilla infused shochu (whatever that is), st. germain, and fresh lime. it was very herbal and refreshing, and thankfully the ginger was only a hint. it was just sweet enough and quite light. i could have easily ordered another. 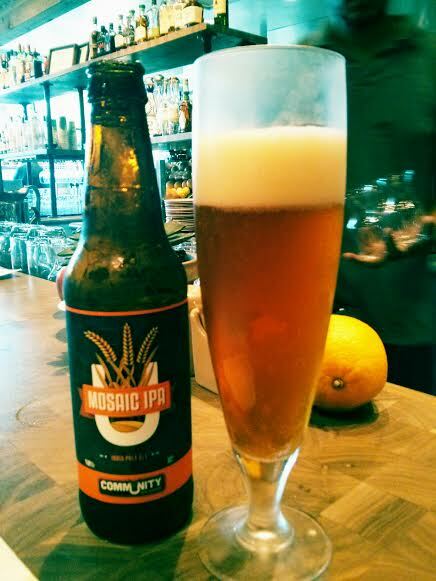 batkinson went with the local mosaic ipa, which he thoroughly enjoyed. marty sipped on his carrot lemonade all night long and loved it. the carrot flavor was not overpowering at all. it wasn’t thick or pureed; it really was a juice. you can distinctly taste the lemon, while the ginger and honey not so much. but! it is a well-balanced mix of ingredients. i would also know because i got it the next night myself. drinks, that i cannot remember, from another meal! you really cannot go wrong with your drink choice here. everything is made right on the spot, and you certainly will be able to tell. i love a little pre-meal snack, so appetizers were of course in order. 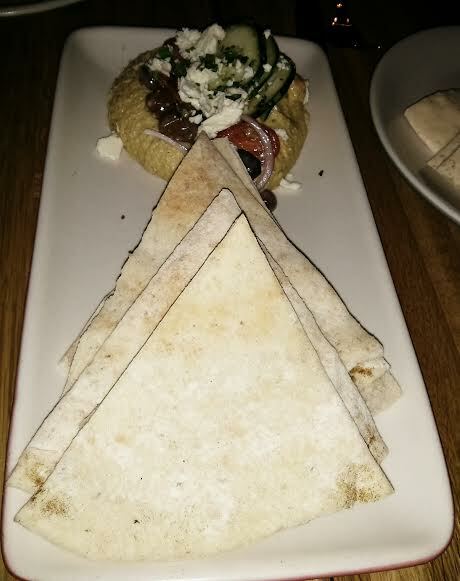 we gave the herb hummus and pita a try one night. there’s a little something extra in the seasoning that makes it stand out a bit. quite delicious! 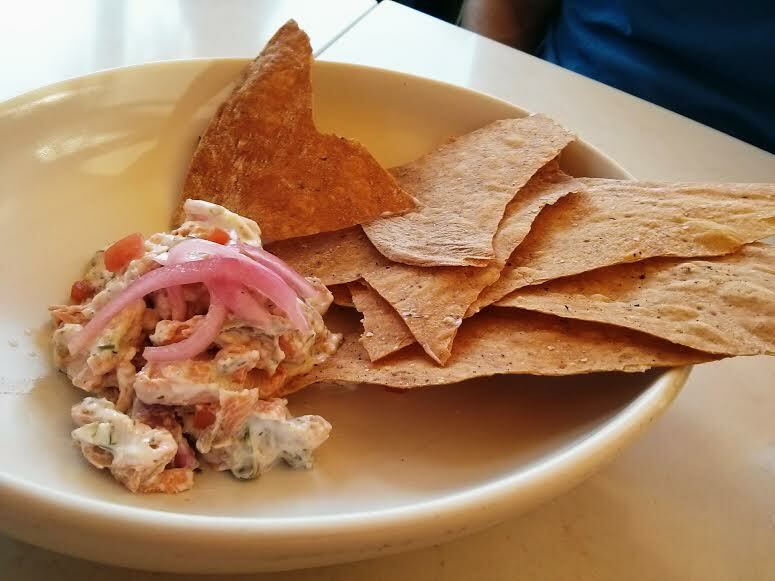 another night we had the salmon dip, and it is one of my favorites. although the portion is a bit on the smaller side, it is worth it. the chili dressing is delicious, and i love that it had almonds. 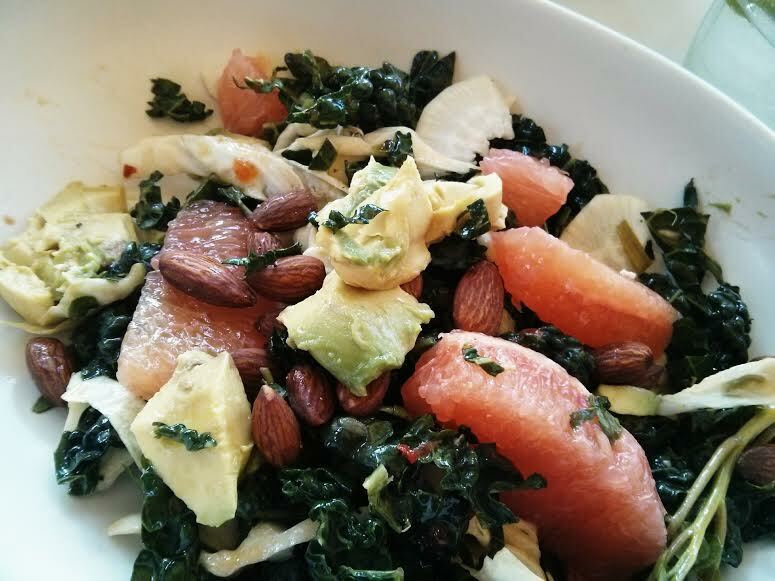 i could have done without the grapefruit, but the avocado made up for it. later in that same meal, i tried the half size of the kale crunch salad, which promptly turned my world upside-down in the best way. the grapefruit slices were ripe and juicy and firm. the almonds? yum. the avocado? smooth and creamy. the water chestnuts? a good addition for texture. i would happily eat this dish over and over again. we enjoyed so many different dishes for our dinners, one of them being the teriyaki bowl. i ordered it with chicken one time, and i ate the entire thing! it wasn’t oversauced, the vegetables were delicious, and the avocado that sat atop it all was an unexpected and welcome ingredient. batkinson ordered it with extra carrots, steak, and no avocado one night. it was a lot then as well. per marty’s recommendation, i tried the turkey burger one dinner. it was fine, but i personally didn’t think it was anything too special. the sweet potato hash on the side was also fine. and as for that herb kale salad? once again, dynamite! marty and batkinson both ordered the roasted chicken one evening. they both declared that every bite was as good as the last. and batkinson couldn’t keep himself from picking up the last couple of bones so that he could savor each and every bite! the base of the roasted chicken is an ingredient called farro. what the heck is farro, you ask? well, it is a type of grain with a nutty flavor and aged roots. it is an ancient and complicated grain worth figuring out according to these boys! 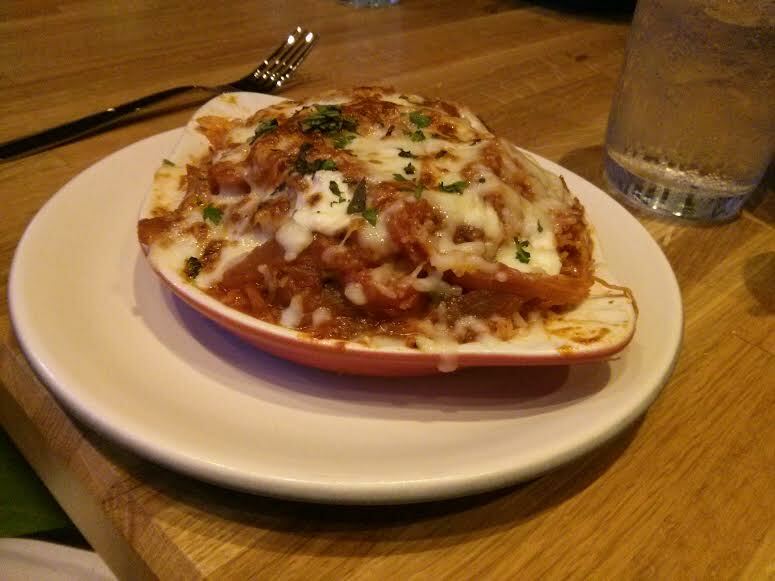 marty went a little untraditional and ordered the spaghetti squash casserole that turned out to be a blast! 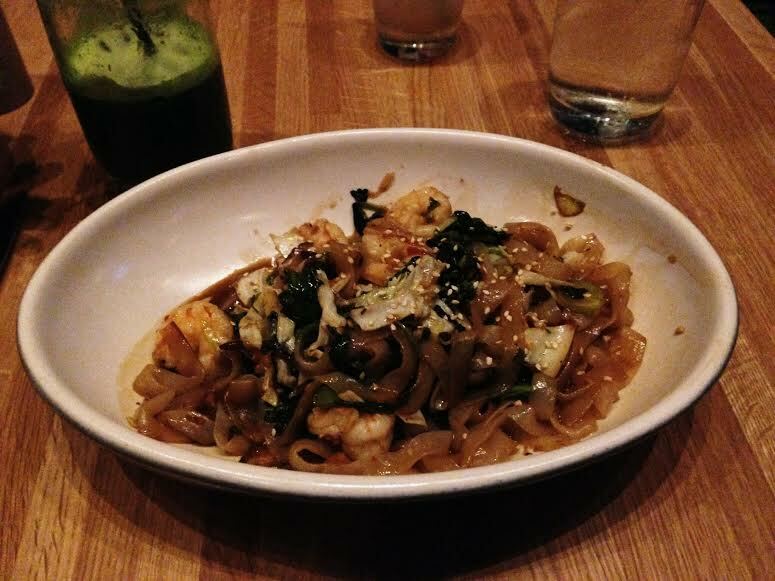 (my friend alison also ordered it and loved it when we visited the location in atlanta.) the mix of tomato and mozzarella was well-balanced and exhilarating. the zucchini slices that were scattered throughout added a nice little crunch. and when he took his first bite, the dangling strands of squash reminded him of hometree from the movie avatar. i’d say that’s a winning dish! 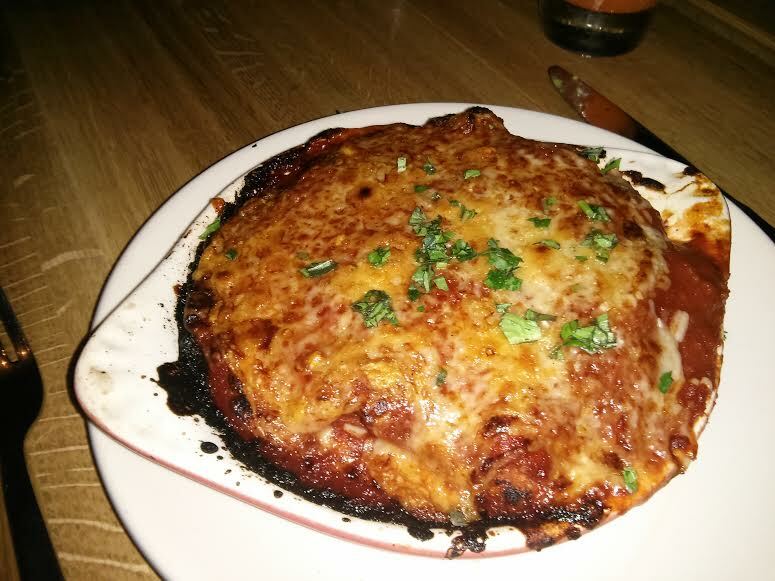 another suggestion by marty was the turkey lasagna, and it was another spectacular dish. it might look small, but its flavor and filling power are mighty! the spinach noodles are untraditional but wonderful. the ricotta and turkey are a great combination. it is a meal i have had several times…no shame! batkinson ordered the chicken sausage pizza one night. it looked and smelled so flavorful with all that tomato and fennel and fontina. i recall him eating the whole thing, and i think i would have done the same. one night marty decided he just had to get something he hadn’t had before, although he did so with hesitation because he liked everything else so much! he went for the red chili shrimp and was very satisfied with it. the whole dish just looks so yummy, yes? there were lots of layers to it, and we even got our learnin’ on with some of those ingredients. shirataki noodles are a low-carb, low-cal, thin, translucent, and gelatinous japanese noodle that comes from something called devil’s tongue yam (aka, konjac). there were some shiitake mushrooms, spinach, and gai lan, which is chinese broccoli or chinese kale. such an educational evening! 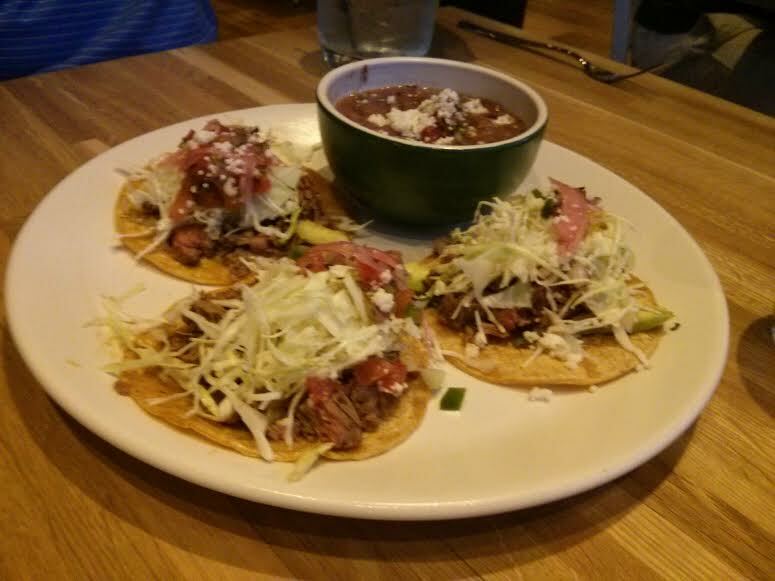 back in atlanta, we went to the newly opened true food for nrw. the people need to know about it! drew was out with us and ordered the street tacos with steak (you can also order them with fish). i was jealous! they stuffed so much good stuff in those tiny little tortillas, including avocado, cotija cheese, tomatillo salsa, sour cream, and anasazi beans. we all know how much i love fish tacos, so there’s a good chance i’ll be giving these a taste sometime soon. at last! we arrive at possibly the best course of the meals: dessert. i have a permanent sweet tooth, so a final bite of chocolate or cake is always, in my opinion, the perfect way to round out a meal. batkinson had a coming of the minds with the waiter one night. the flourless chocolate cake with pistachio sorbet and coconut whipped cream. they were all brilliant together! marty was ecstatic for true food dessert, enjoying the lemon ginger and pomegranate sorbet. although the candied rinds were a bit thick, they were still quite edible. my first dessert was the lemon tart with strawberries and whipped cream. i even ordered a little extra of the cream, per our waiter’s strong suggestion. wink wink, nudge nudge. the most adorable whipped cream ever! 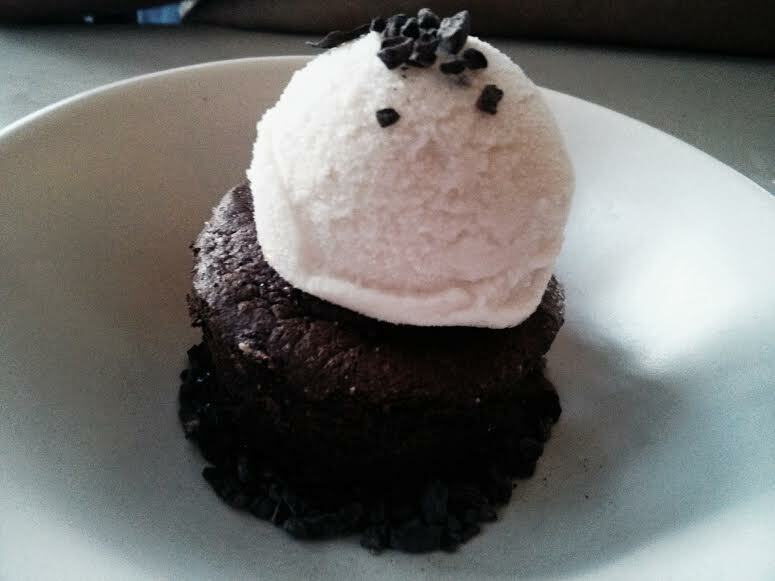 the next night i gave in to the tempting flourless chocolate cake with vanilla ice cream as well. it is rich and sweet and just enough for one (not enough to share, if you ask me. but i can be a greedy eater at times…”joey doesn’t share food!” friends reference, anyone?) right at the very bottom is the sweetest caramel surprise. it has a teeny, yet tasty, role in this experience. although it wasn’t necessary, and quite subtle, it was a graceful touch. 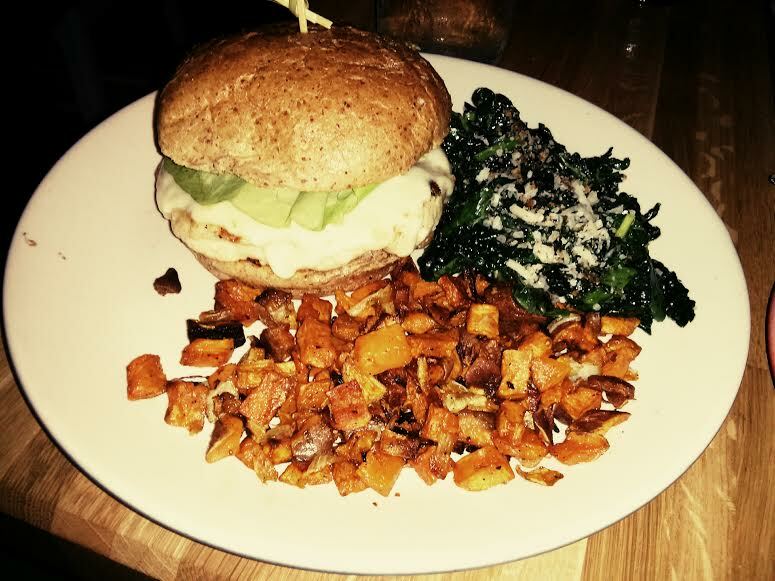 true food kitchen may not be for everyone, but it certainly is for me. the one here in atlanta, that just opened up next to lenox mall, will probably be having me as a regular patron. 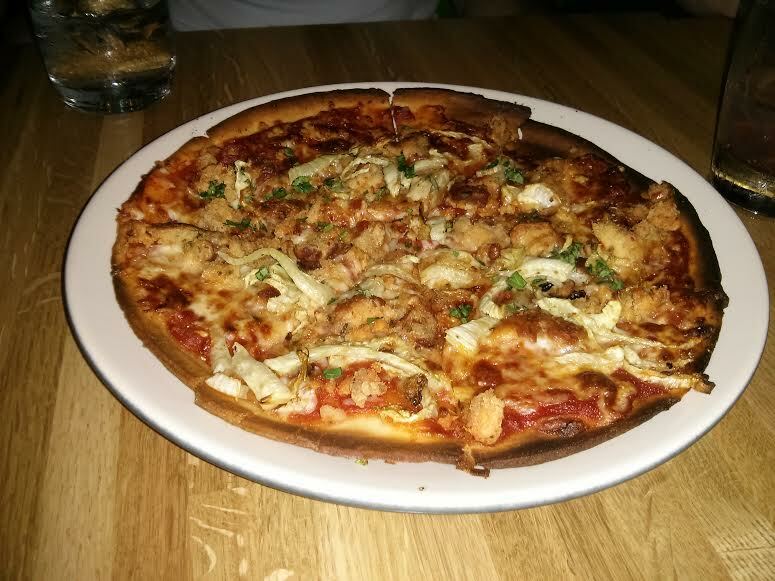 it’s the perfect place to go when you’re in the mood for something a little untraditional and delicious. if you ever need someone to join you, hit me up! It is! When I come back in town next week, we should meet up and go! How about Monday or Tuesday next week?